Are you still managing your orders manually, and recording them in traditional stock ledgers? Well, it is easy when you have a small business and only a few orders to process. However, the task of managing orders can be really difficult and time-consuming when it starts to grow. The order management software can help you out to sort out this problem. It can easily organize the orders from different sales channel to help you to fulfill the orders efficiently. 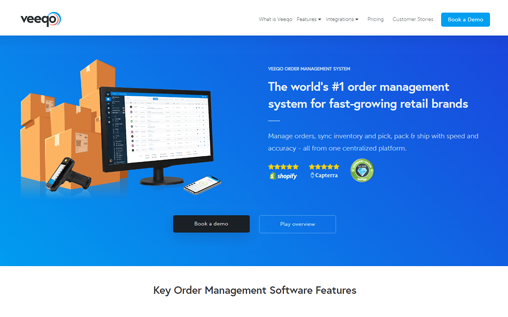 It can be a hectic task to go through each and every order management software, so to save your time, we have listed the best order management software. 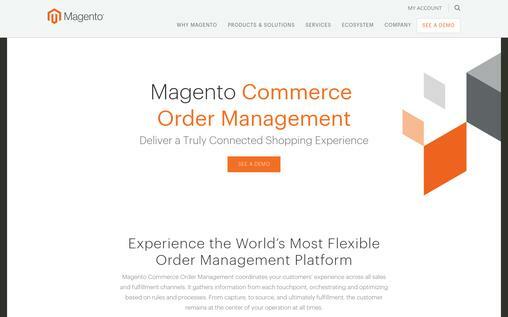 Magneto is a popular shopping cart software also offering order management solution. It allows you to manage the orders from different sales channel to deliver the best customer experience. You can view the orders and inventory on a single screen, and it will also show intelligent sourcing logic. This will allow you to fulfill the orders from the best location. Magneto collects all the vital information from each touch point from capture, source to fulfillment, and it automatically organizes the information according to the prescribed rules. Magneto is very easy to use because of its simple interface. You can keep track of your remaining stock and sold items, which allows you to always maintain the right amount of inventory. The advanced analytics tool lets you view key statistics like top sellers, shipping reports, and more to get key insights about your business. Linnworks is an user-friendly order management software full of exclusive features. 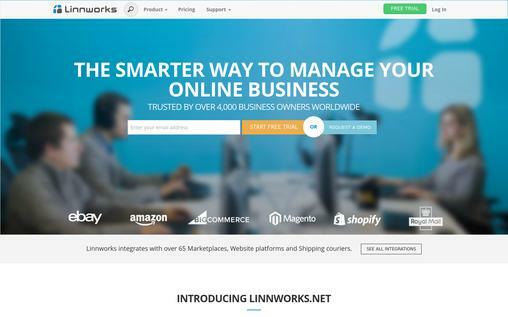 Linnworks integrates with more than 65 marketplaces like Amazon, eBay etc, website platforms like Magento, Shopify etc and shipping couriers like Royal Mail. It is very easy to organize your orders with a simple Linnworks interface. It has maintained extra servers to make the platform exceptionally fast. You can manage your orders from anywhere, as Linnworks run perfectly on windows, iOS, and android operating system. You can easily integrate Linnworks with many e-commerce platforms like eBay, Amazon, Shopify, and more. When the product sells on one platform, the stock is automatically updated in the software. Your orders can be viewed in a single centralized place, and it makes it easier for you to check out the product’s status to see which products need to be packed and shipped. This software automatically contacts the vendors to make sure the stock is always at an optimum level. You can easily import or export stock information using CSV files to syncronize your physical stock to online platform. The detailed analytical tool allows you to check out detailed report on individual channels, specific product and categories, stock, shipping reports, and more. You can choose from 3 packages provided by Linnworks to get started, and they are Free, Professional, and Enterprise Package. The professional package costs $200 per month (2 users). 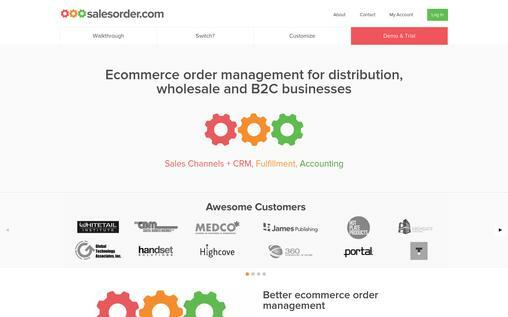 salesorder.com provides all the necessary features that help you to manage your orders efficiently. You can integrate the major shopping carts with salesorder.com to manage all your order with one database. Your sales team who works in a warehouse and the finance team who needs accounting information can easily learn to use this software. You can track and capture your customer’s order details in a single view, whether your customers buy and interact with you on the phone, email, app, or online. You don’t need standalone accounting systems like Xero, Sage, and others, thanks to the built-in accounting platform in salesorder.com. The smart reporting tool of salesorder.com provides all important insights about your sales, accounts, and others. The WYSIWYG editor of salesorder.com allows you to add to any screen custom fields to store and report information according to your needs. The repetitive tasks can be automated with the help of workflow automation engine of salesorder.com to save your time. Veeqo helps fast-growing retail brands manage orders from every sales channel in one centralized platform – without ever overselling or missing an order again. Bulk print hundreds of invoices, picking lists, packing slips and shipping labels at the click of a button. Manage your orders perfectly with powerful organizational tools. Find anything with intelligent Smart Search while prioritizing and sorting with advanced filtering options. Create unlimited templates for invoices, packing slips and picking lists so you can sell with custom messaging under multiple brands and sales channels. Sort by store, delivery method, destination, Amazon Prime, order weight, items per order, inventory locations, order date, date shipped or any way you want. You can segregate the specific duties to different employees who are involved in processing and fulfilling orders. The costs and gross profits are calculated in real-time using various methods. You can customize the price with discount or mark price. You can also choose the price in many different currencies to sell in different countries. The warranty profile management feature lets you define the warranty on each product, which includes coverage, start date, time period, and others. The task of handling orders and tracking it becomes a way lot easier with tradegecko. The organized and integrated data in tradegecko lets you manage your orders looking at the inventory, and you won’t be making any errors while managing your orders. You can easily send sales quotes and also edit it whenever you want to. 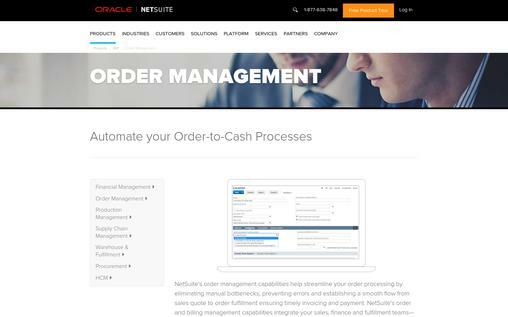 You can manage the status of order, and mark whether it is an active order, finalized order, or fulfilled order. All your sales orders from different channel like wholesale request, online channels can be managed with a single interface. The real-time sales report can be accessed with the help of real-time reporting tool of tradegecko. The iOS mobile app lets you capture the sales order from anywhere like when you’re at a trade show or in a sales meeting. 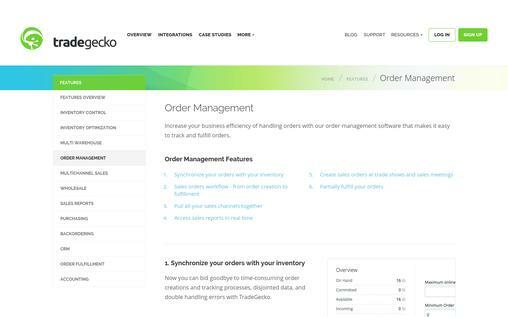 You can partially fulfill the orders with unique fulfillment options provided by tradegecko, where you can only fulfill orders according to your capacity. Orderhive lets you create beautiful sales invoices by allowing you to add customized messages, print sales invoices, and email it. You can fulfill your order partially and send out the only the quantities you are ready to ship. You can track your shipping with 300+ courier companies, and you can also get instant notification when the order is shipped. The detailed business analytics lets you view the stock status, best selling products, best shipping rates, and more to further improve your business in the future. You can choose from Starter, Basic, Business, Premium, and Orderhive Plus Package. The starting package costs $49.99/month. 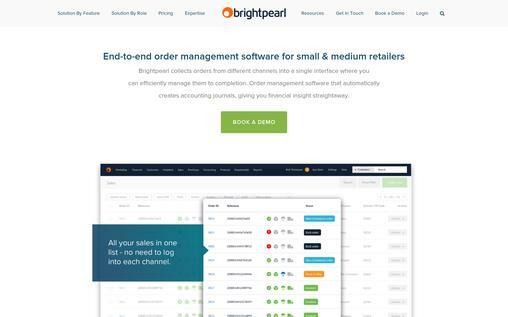 brightpearl provides a wonderful order management software for businesses of all sizes. All the orders from different channels can be managed from a single interface with brightpearl. You can also view the relevant status of the shipping with brightpearl. The simple and interactive interface of brightpearl let you access to a variety of features easily, which are needed to manage your orders. Your inventory is automatically updated whenever the sale is made. The low stock reporting feature allows you to reorder whenever the stock is running out to help you maintain the optimum level of stock. The smart reporting tool of brightpearl provides you the key insights of information like top products, slow movers, demand, stock, and more to help you improve your business. Know about the stock present in a specific location of your business to ensure the regular supply of the goods to customers from different region. The information about sales, inventory, and purchase orders are found on one platform with the help of this software, allowing you to develop a smart business strategy. You have the option to choose from 3 packages, and they are Entry, Growth, and High Growth. The starting price is £250/month. 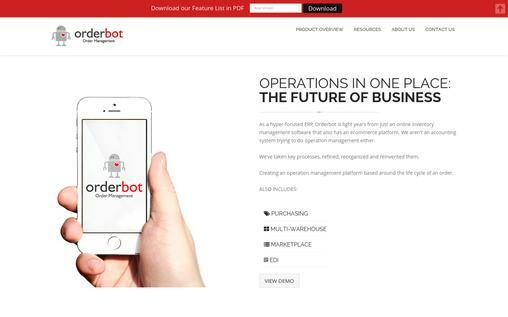 Orderbot lets you manage your orders without any errors, which ensures your customer’s satisfaction. The task of managing the inventory in various geographical locations becomes very easy with Orderbot, as you can track it easily with Orderbot to ensure the optimum level of stock. It offers a centralized data entry point, where all the data from different channels is joined together in a single platform. Orderbot lets you accept payments in multiple currencies and convert them as required. You can track the orders and stock by serial numbers, lot, and dates. Orderbot gives you total control of the pricing, and you can control it via events, amounts, or customers. You can integrate Orderbot with various channels like eBay, Amazon, and more to further make it easier for you to manage your orders. Your customers can pay for the orders through different payment methods and gateways. 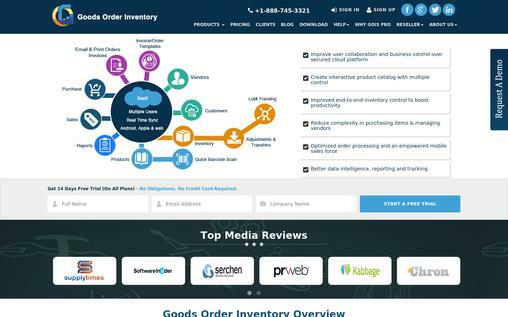 Goods Order Inventory helps you to carry out the order management function efficiently. The exclusive features help to increase the return on investment. It is extremely easy to search and add products instantly to the software with barcode scanning. If you are not able to take orders, then this software will let you easily cancel the order, and it will also avoid unwanted orders. The mobile application provided by Goods Order Inventory allows you to work online or offline from anywhere. You can easily track your inventory according to lot number. You are notified about the stock whenever it is running low. Goods Order Inventory allows you to see the detailed reports on its platform or via Excel showing key insights about inventory, top selling goods, and more. You can categorize the products based on its characteristics, and you may even clone it if needed for efficient order management. There are 5 packages to choose from, and they are Starter, Basic, Standard, Advance, and Premium. The starting price is $18.99/month. 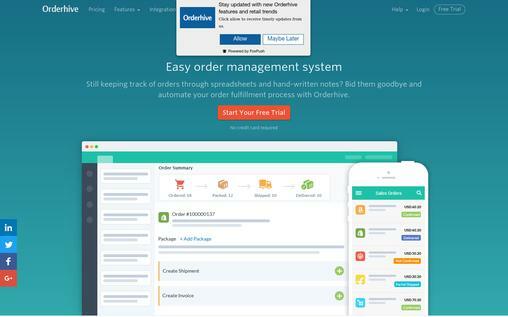 ORDORO is extremely beautiful and easy to learn order management software, which allows you to get started quickly. You can download your orders from multiple stores and marketplaces and start managing them in a single platform. You can also compare the shipping price between various shippers like UPS or Fedex to choose the best and cost effective shipper for shipping. 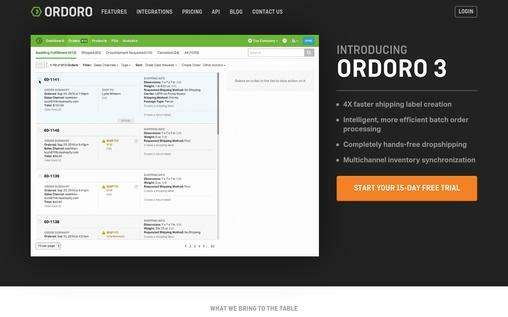 Tracking your orders becomes very easy with ORDORO. Sales channel immediately gets the tracking number as soon as label is created, or an email is automatically sent to your customer as soon as their order is shipped. ORDORO lets you track the inventory cost by calculating and tracking the unit cost of each item. You can sell your products in a different sales channel without any worries. You can sync ORDORO with various platforms, and the record is automatically updated whenever the sale is made, avoiding the risk of overselling. It automatically splits the order and sends their portion to specific suppliers. The advanced analytics lets you see the performance of each sales channel, segment revenue, and costs of shipping, and more to further improve your business performance. The pricing plan of ORDORO starts from $99/month (shipping + order management). If you were manually managing the orders, then the features of order management software must have got you excited, as it will save a lot of time for you. Moreover, the chances of making errors are also eliminated, and your customer’s satisfaction will obviously increase after you fulfill the orders efficiently.